VIENNA, February 14. /TASS/. 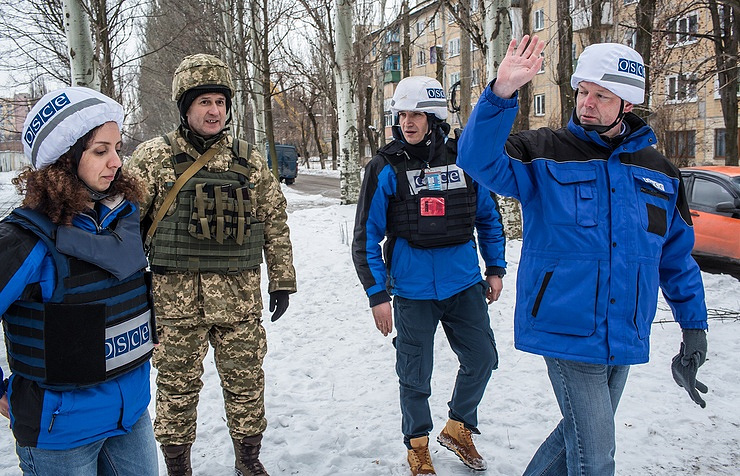 Observers from the OSCE Special Monitoring Mission continue monitoring blockade of railway tracks along the contact line, an SMM report for February 13 said. It quoted the head of a railway station terminal in Yasynuvata as telling the SMM that no cargo trains had arrived from government-controlled Kostiantynivka (60km north of Donetsk) in the past three days. "On 12 February, in government-controlled Hirske (63km west of Luhansk), the SMM observed two unarmed men in camouflage fatigues who remained near a tent at the site of a railway track blocked by tree trunks. The SMM noted that one police officer was present at the scene," the report went on. "In "DPR"-controlled Yenakiieve (41km north-east of Donetsk) a manager at a steel plant told the Mission that if the blockage of railway traffic to and from areas not controlled by the Government continued, the plant’s two blast furnaces would become inoperable within a month," observers noted. "He said that the closure of the factory could endanger up to 15,000 jobs in the steel industry," the report said, also quoting representatives of a power plant in government-controlled Mykolaivka (95km north of Donetsk) as saying "the blockade affected coal supplies to the plant which provided heating for about 15,000 people". "The men went on to say that the power plant was dependent on a type of coal found in areas not controlled by the Government," the report added. The blockade was imposed on January 25 by former militants from the so-called ‘volunteer battalions’ with support from the right-wing radical deputies of the Verkhovna Rada national parliament. 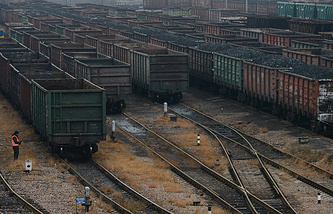 Specifically, the radicals are blocking the railway lines, by which anthracite coal is hauled to the thermal and thermos-electric plants from the mighty coalmines located in the self-proclaimed unrecognized Donetsk and Lugansk People’s Republics. The radicals claim that the blockade is necessary to plug the channels for an inflow of contraband commodities allegedly trickling into Ukraine alongside with coal. Ukraine’s energy and coalmines minister Igor Nasalik said on Monday the reserves of anthracite coal in Ukraine totaled 842,000 tons at the moment while the average daily consumption of the fuel stood at 30,000 tons. This means that, depending on the patterns of consumption, the reserve is enough to keep the power generating system in operation for 40 or so days. Nasalik also warned that disruptions in the national electric power grids might already in fourteen days’ time. Nonetheless, Anatoly Vinogrdosky, a coordinator of the Donbass blockade said the radicals would continue their campaign.